Heading home from Vancouver and an excellent, exhausting weekend at the Trumpeter Salute show! Good to see most of the Trumpeter regulars, many of whom I only ever see once a year at this show. Great games all weekend, including the six player Pulp Alley game I ran Sunday, “Terror in the Thuggee Temple”, which was a gloriously confused and messy multi-sided mess enjoyed by all. I got a good crop of photos all weekend, including a bunch of my own pulp game, and I’ll get them edited and posted here soon! Off to Trumpeter Salute 2016! Heading off to Vancouver today for the always excellent Trumpeter Salute wargaming show this weekend. I’ve finally gotten around to setting up the Android WordPress app on this phone so I’ll update from the field as I remember to, then do my usual photo dump once I’m home. I’m running a Pulp Alley game sometime this weekend but can’t actually recall when it is. Looking forward to seeing all the Trumpeter regulars this weekend! Off overseas (ie, to Vancouver) Friday afternoon to spend the weekend at one of the area boardgame conventions, BottosCon. Boardgames? It’s likely to be a pewter-deficient gaming event, true, but it’s mostly an excuse to get out of town for the weekend and hang out with an old friend who has recently moved back to Vancouver. Who knows, I may see some familiar faces from Trumpeter Salute, and I may even sell a few more t-shirts. We shall see. If you happen to read this and are going to be at BottosCon this weekend, leave a comment below, the magic of smartphones means not being cut off despite being away from our computers! Trumpeter Salute 2011 Photos & More! Took a fair number of photos while having a great time attending Trumpeter Salute 2011 this last weekend, and a surprising number of them actually turned out good! Here’s a narrated photo tour of Trumpeter Salute from my point of view. Just a very short post to say Trumpeter Salute was awesome, lots of fun games and great people. Good to see friends and regulars again, and meet new people. 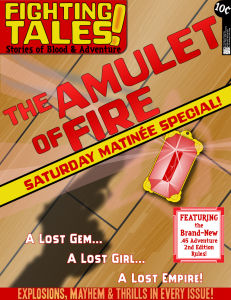 I ran Amulet for a full group of six players, using the .45 Adventure 2nd Edition demo rules. The game went well but we never actually got near the mesa (Chapter Two) because although 2nd Ed does flow faster than 1st did, I put too many figures on the table. Sorting photos now, will have a longer post tomorrow probably with lots and lots of photos, a list of my goodie haul (extensive!) and more! Amulet of Fire characters all converted to .45A 2nd Edition. With a certain amount of cut’n’paste magic in Open Office, but whatever. Grade One mooks & goons are all alike anyway, right? I usually try not to do this, but lack of time has forced my hand. I’m planning on re-re-building all the cut’n’paste victims at leisure post-Trumpeter, though. Needs must when working seven day weeks, attempting to keep up with LPL, and getting ready for a convention! Beer. Bed. Work tomorrow, then packing for Trumpeter, then Trumpeter starting Friday afternoon. 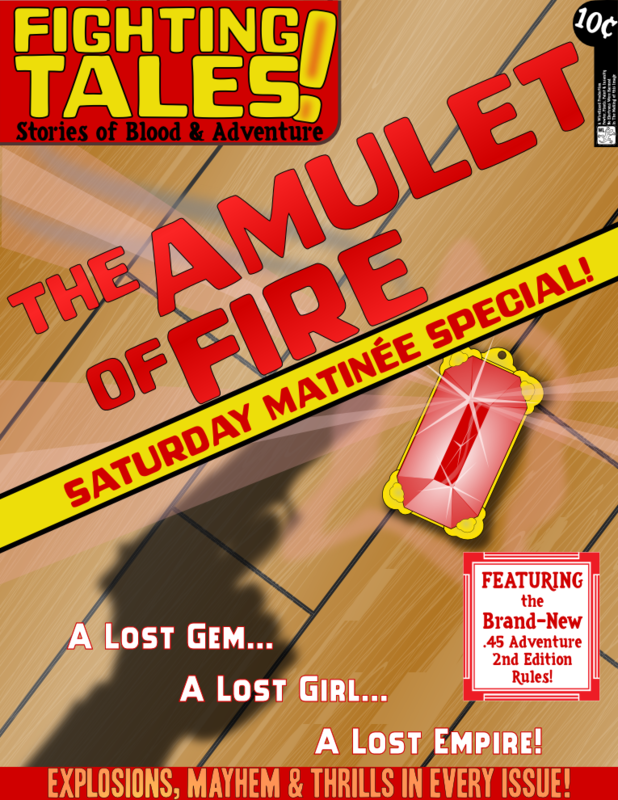 Trumpeter Salute 2011 will feature the Saturday Matinée Special .45 Adventure 2nd Edition version of Amulet of Fire! Click for full-size image. Alongside the Lead Painters League over on LAF, the other thing keeping me amused this week is getting ready for Trumpeter Salute 2011 over in Vancouver (well, Burnaby, really, but close enough…) this weekend! Trumpeter is the region’s “big” gaming convention, really, at least on the Canadian side of the border. This will be my third visit in four years, and it’s always a highlight of my gaming year! I’ll be running Amulet of Fire again, going over with a friend who has space in his car for the mesa and other stuff needed for it. I’ve (possibly foolishly…) promised to run Amulet in the barely-just-released 2nd Edition of .45 Adventures, so I’m busy tonight rebuilding all 30 or so characters for all six teams of Amulet. I’d say “converting”, but really 45A 2nd Ed has a different enough character & skill system that I’m rebuilding! Some interesting differences between the new and old versions; must do a full review here of 2nd Ed after Trumpeter! There will be a bit of a Lead Adventure West Coast meet-up, partly over my Amulet game on Saturday. Always nice to see some of the Vancouver-area folks again, throw more money at Bob Murch & Imperial Hobbies, loose at games, and all the other traditional convention activities!